by Peter Burgess The year started in the usual fashion with the Christmas meal at the March Hare, Broughton Hackett. A very good meal was enjoyed by the diners, which was followed by three presentations. Firstly thanks to Rob and Louise Fitton who travelled down from Lancashire to present the prizes for the 2007 Herd competition. The results are printed in last years Review. A presentation was then made to John Fellows who was about to become an Octogenarian. John is a founder member of the club and has been treasurer for as long as I can remember! A further presentation was made to another founder member, Rob Hewlett, who has stepped down from the manager’s post at Boddington Estates and is now in “semiretirement”. Best wishes to both of these club stalwarts. A bumper raffle rounded off a very enjoyable evening. Due to the cancellation of our 2007 calf show the AGM was deferred to January and was held along-side a quiz. The AGM was over quickly with all of the club officers being returned. The well attended quiz, with quiz master yours truly, was won by a team from the Midland Club headed by the Martindales. Runners up were a team of Charolais breeders. The annual dinner was held in early May at the Kings Head Worcester, where the size of the helpings has to be seen to be believed. Following the meal a presentation was made to club members Richard and Jill Wilcox to mark the occasion of their Golden Wedding Anniversary. Congratulations to you both. Guest speaker this year was local farmer Alan Grosvenor who kept the diners entertained with his hilarious tales and anecdotes. He is definitely to be recommended. Kenilworth Show went ahead in early June and was well supported by Simmentals despite some regulars being unable to attend due to BTV restrictions. Winner of the Supreme Championship, for the second year in succession, was Roger Birch, this time with Pasturefields Turbo Tommy. A farm walk was held in conjunction with the Midland and South West Clubs at the end of August in Lower Boddington, near Daventry. Firstly we visited the 200 cow commercial suckler herd of Bill and Mary Adams at Springfield Farm. Simmental and Angus bulls are used with Simmental X heifers kept for replacements. All other progeny is finished on farm and sold to Waitrose from about 18mths old. This herd is a tremendous advert for the Simmental suckler cow in a commercial situation. Heifers are calved at two years old and the uniformity of the calves throughout the whole herd,both Simmental and Angus X , are a real testament to the mothering abilities of the Simmental cow. Being an arable farm as well, the winter rations are based on straw which also illustrates the adaptability of the breed. Many thanks to Bill and Mary and also Ed and Jenny Dudley. Ed is head stockman and gave a marvellous commentary as we were shown around the very impressive herd. From here we went to Tilbrook Farm, also at Lower Boddington to look around the Chairman’s herd! There is no doubt of the main attraction on this visit -—- lunch! Thanks to Sarah for all her hard work in preparing a fabulous meal for the 50 or so people attending. The herd competition took place in early September. Judges this year were Gethin and Envys Lloyd who after spending three days travelling around our area agreed to return and present the prizes at our calf show. Gethin and Envys also brought with them a special prize which they presented to David Savins of Warwickshire College for all of the work he does in encouraging the young to be involved in the breed. Many thanks to you both for undertaking the task. The aforementioned calf show was held at the end of September at Cirencester market. The show was very well supported both in numbers of cattle and people. Fittingly the Judge this year was Graham Fishlock, ex herdsman at Boddington Estates, whose idea it was to hold such a show many years ago! The show this year was thrown open to non club members, however we might revert back next year as Male Champion was won by “outsiders” David and Lesley Sapsed! Thanks to Graham and everyone who helped to make the show such a success. I would just like to finish by thanking the committee and members alike for supporting the club during the past year with special thanks to Secretary Sam Evans for the time and effort she gives the club. Here’s hoping for a restriction free year! It was with a mixture of surprise and shock that I found myself Chairman of the Centre West Simmental Club at the AGM held after the calf show at Cirencester market, the last weekend in September. I would first like to thank on behalf of the members, Judith Cockerill for the work and commitment she gave to the club during the six years she held this post. Our year started as usual with a well attended Christmas meal at the March Hare, Broughton Hackett. Good food, good company and a marathon raffle ensured the evening passed enjoyably and very quickly. In February a skittles evening, very ably organized by David Bell, was held in conjunction with the Midland Club. The finely tuned athletes gathered at the Rose Inn, Baxterley and after a fiercely contested competition sat down together to enjoy a very welcome meal. It’s always good to share evenings with other clubs giving members a chance to catch up with fellow breeders. March saw our Annual Dinner held at the Kings Head, Worcester, again well attended and with a bumper meal! Guest speaker was Vet Jack Waters from Solihull who entertained the diners with a mixture of amusing anecdotes and views of the veterinary profession. One of these was his concern at the lack of students willing to take on large animal medicine. Something certain to cause a shortage of farm vets in the very near future. Beginning of May and a farm walk, by kind permission of Capt. Hannay, around Springhill Estates, Moreton-in-the-Marsh. Our thanks especially go to Ros Allen for all her efforts in making this event such a success. Around sixty people clambered aboard trailers, on a beautiful spring day, to be shown around the 180 cow suckler herd on this 2000 acre Cotswold Estate. Simmental and Angus bulls are used breeding heifer replacements, with the remainder being sold as yearling stores. The cattle enterprise is a prime example of the value of Simmentals in a commercial situation, with traits such as milkiness in the females, growth rates, temperament and the fast improving conformation of the breed being very evident. The cattle, sheep and whole Estate are a credit to Ros and her staff. I would also like to take this opportunity to thank Schering Plough and in particular Dave Meakin, for their generous sponsorship of this event. 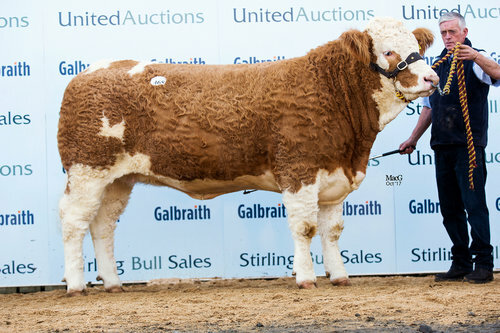 A week later the Club held a small bull sale at Cirencester market with the top price of £2800 being paid for a Sterling bull from Boddington Estates. One of our local shows, Kenilworth, went ahead in glorious weather at the beginning of June. A good turnout of cattle with the Champion being shown by Roger and Steph Birch. Unfortunately Roger missed his moment of glory as he was in Warwick hospital having his finger stitched back together after a slight mis-hap! I don’t need to remind everybody of the disruption caused to events later in the year, however we did manage to hold our herd competition in early September. Judge this year was Robert Fitton who travelled down from Lancashire to spend three days in our area. Due to the cancellation of our calf show Robert has kindly agreed to present the prizes at our Christmas meal. Another epic journey for you Robert! Many thanks to Robert for taking the time and making the effort to complete the task with such a positive attitude. Due to the ongoing problems we have not yet held our AGM, but I would like to thank the committee and all the members alike for supporting the Club during the past year. Special thanks go to Secretary Sam Evans for keeping me on the straight and narrow! Simmental cattle are still very underrated by many people but I believe with continued improvement and by focusing on the commercial market the breed has a huge future.